Do you need ideas for some relaxed summer learning? 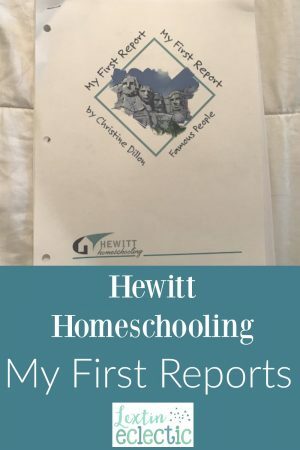 I had the chance to review My First Reports from Hewitt Homeschooling. My First Report is a pack that contains multiple topics based on a central theme. Each topic has a list of questions that are to be answered after a child has completed some research. At the end of each packet are unit study ideas for each subject as well as lined paper for writing practice. This product has multiple options so you can choose topics that most interest your child. By doing one page per week, each packet would be completed in one quarter. My First Report is a simple way to teach research skills and start a research project for kids in 3rd or 4th grade. They also work well for older students who need extra practice, and it’s also easy to add in younger students for some of the projects and activities. I like to think of them as relaxed unit studies as well. There are many other options on their website. You can see all the choices here. We used the Famous People First Report first, so I’ll share a little about what’s included and how we used it. The first portion of the unit study has questions that correspond to each topic. These are a perfect jumping-off point for research and are good discussions questions as well. The second half of the report contains unit study activities for a variety of subjects. There are also notebook pages that have copywork and word searches for fun. This report covered multiple people from different historical time periods. The unit study in the back of the report had activities to correspond to all of our major subjects. There is also an extensive list of children’s books to correspond to the various topics. This was so helpful to me as I planned our study – it gave a starting point to help me find resources for our study. How we used the program…. I let my oldest child be the lead with My First Report. I gave her the list of questions for each person and a stack of books to help her research. I also sent her an email with website links or links to YouTube videos about each person. She then was able to teach her younger siblings. She really enjoyed putting in the time to learn about each person so that she was prepared for discussions with her siblings. I also had her write out some of her thoughts in short essays, using the report questions as a guide. I used the report as a starting point to teach them how to write complete sentences and put those sentences together to write a very simple and short essay. It was a good introduction to narrating back parts of a story and then writing a brief summary of what they learned through the books that they read. She listened in as we read books about the various famous people and she participated in a few of the unit study activities. One of the best parts of My First Report is the ability to work together as a family on the same topics. My kids studied a few of the famous people as a group. My older children read the books aloud and prompted the younger ones with some questions from the guide. My kids worked together to create a poster to display information about a famous person. They also put on a short play about one of the other famous individuals that they studied. Some of our favorite activities from the unit study portion were to discuss the Scriptures used to argue against the earth revolving around the sun and the different beliefs of people during those times as it related to religion and science. We also wrote down the famous people on a timeline and included some major world events that happened during their life times. We memorized the Preamble to the Constitution and are working to memorize Lincoln’s Gettysburg Address. We also had fun with gravity by checking the weight of each other and weighing different items around the house. And my oldest learned America, the Beautiful on the piano, while my younger kids memorized Yankee Doodle. I really enjoyed the flexibility of the reports. It’s easy to pick and choose which topics to cover or which sections of the unit study to use. I also liked that they work well for a variety of ages, allowing me to teach all of my children together. I could have my oldest child work on them independently and write short research essays. With my middle kids, we could work together and create reports and projects. And my younger ones could listen in and learn some basic facts about the famous people. I think these reports would be a wonderful resource when scattered throughout the homeschool year to bring some variety. I especially enjoyed using them as part of our early summer studies since our regular homeschool year is winding down. They were the perfect way to keep learning once we had completed some of our regular studies, as well as to complete projects and activities as a group.